Dr. Marietta Scanlon (far right) mentored the Triamatis team composed of Tito Orjih (center) and Jason Lehrer. This is the challenge that the Penn State Berks team, Trimatis, is tackling. They have been selected as one of 10 finalists in Lancaster’s Great Social Enterprise Pitch, an idea incubator and business plan competition for concepts that use a business model and revenues to have a positive social or environmental impact. Trimatis LLC is composed of CEO Marietta Scanlon, who holds a Ph.D. in Materials Engineering and is an Assistant Teaching Professor in Engineering at Penn State. Scanlon has been working in the 3D printing field and on STEM outreach initiatives for years. CTO Jason Lehrer recently graduated from Penn State Berks with a B.S. in Mechanical Engineering and has been conducting research for over a year on how to use recyclable plastics in the 3D printing process. CMO Tito Orjih, a junior Electro-Mechanical Engineering Technology major, completed an internship with an environmental stewardship nonprofit organization and brings marketing and promotional skills to the project. Using their patent-pending technology, Trimatis LLC plans to convert plastic waste into 3D printer filament. The plastic waste, most commonly used in plastic bottles, will be collected, processed, and manufactured into spools of plastic filament. These spools will be provided to schools and universities, who are already utilizing 3D printing in their curriculum and understand the importance of sustainability. For The Great Social Enterprise Pitch, the team will attend an Idea Incubator, held on Tuesday evenings during the summer where they will cover topics such as impact, finances, marketing and business plans. After the Idea Incubator is complete, they will prepare a Crowdfunding campaign in August, and then five participants will move on to the Live Pitch to be held in September. This isn’t the team’s first entrepreneurship competition. Trimatis was one of six finalists in this year’s Inc.U competition, sponsored by Penn State’s Pennsylvania Technical Assistance Program (PennTAP). The finalists earned a spot on WPSU’s “The Investment” television show where they will pitch their ideas in a Shark Tank-style format to a panel of judges for a chance to win investment funding. The show will air on WPSU-TV on May 24, at 8 p.m. The idea for the project originated from Lehrer’s research with Scanlon. He began conducting relevant research with Scanlon in the summer of 2016 and has been working on research related to this project since last summer. They soon realized the commercial potential of the project. Meanwhile Orjih had similar interests. He was also interested in business and marketing. He completed an internship for an environmental company in Philadelphia, which led to his entering a contest sponsored by National Geographic with a similar project idea. Scanlon thought the two students complemented each other and introduced them. Soon they were collaborating on the project. 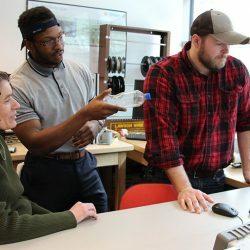 According to Lehrer, the team name “Trimatis” is Lithuanian for “three dimensional” and the name not only encompasses the subject of the project but also the three people who have brought it to fruition: himself, Orjih and Scanlon.